Dodd Frank: What was intended; How are we doing? 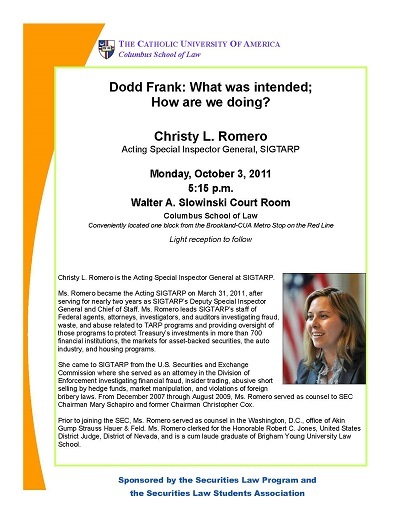 Christy L. Romero, Special Inspector General for the Troubled Asset Relief Program (SIGTARP) acting special inspector general, spoke on Oct. 3 at the invitation the Securities Law Program and the Securities Law Students Association about the causes of the historic financial bailout, SIGTARP’s role in it, and how Congress’s response—the 700-page law known as Dodd-Frank—is working out so far. Romero, Christy L., "Dodd Frank: What was intended; How are we doing?" (2011). Securities Law Program Lecture Series. 17.